VMware has been named a Leader in the July 2018 Gartner Magic Quadrant for Unified Endpoint Management (UEM), positioned highest in ability to execute and furthest in completeness of vision for our product solution. As market focus has shifted from client management tools (CMT) and EMM to UEM, VMware has maintained a rapid pace of innovation to help customers prepare for the next generation of digital innovation, including modern management for Windows, macOS, Chrome OS, iOS, and Android, comprehensive support for rugged and workplace IoT endpoints, analytics capabilities, and support for customers migrating from traditional network-based CMT to modern UEM-based PC management. Download Gartner's new Magic Quadrant to see why we believe VMware is uniquely positioned to help you improve cost savings, security, and user experience with Workspace ONE UEM, powered by AirWatch technology. 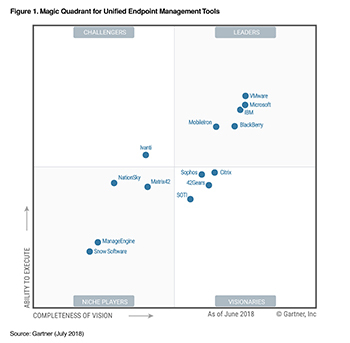 Source: Gartner, Inc., Magic Quadrant for Unified Endpoint Management Tools, Chris Silva, et al, July 23, 2018. Gartner Disclaimer: This graphic was published by Gartner, Inc. as part of a larger research document and should be evaluated in the context of the entire document.